Be sure to stop by to visit me and other vendors at the Boutique in the library's auditorium before or after your visit to the beautifully holiday-decorated Rochester area homes. This is a popular event benefitting the beautiful Rochester Hills Public Library. 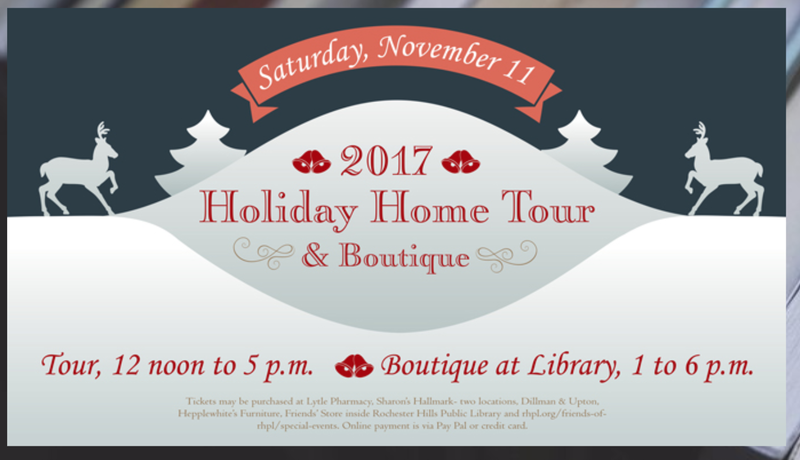 Tickets for the tours are available at the Friends' Shop inside the library, Lytle Pharmacy, Sharon's Hallmark - two locations, Dillman and Upton, and Hepplewhite's Furniture. Choose Friends' Special events to make online payment via PayPal or credit card at www.rhpl.org/friends-of-rhpl/ . See you, Saturday, November 11!! OPC a Great Place to be 50+!